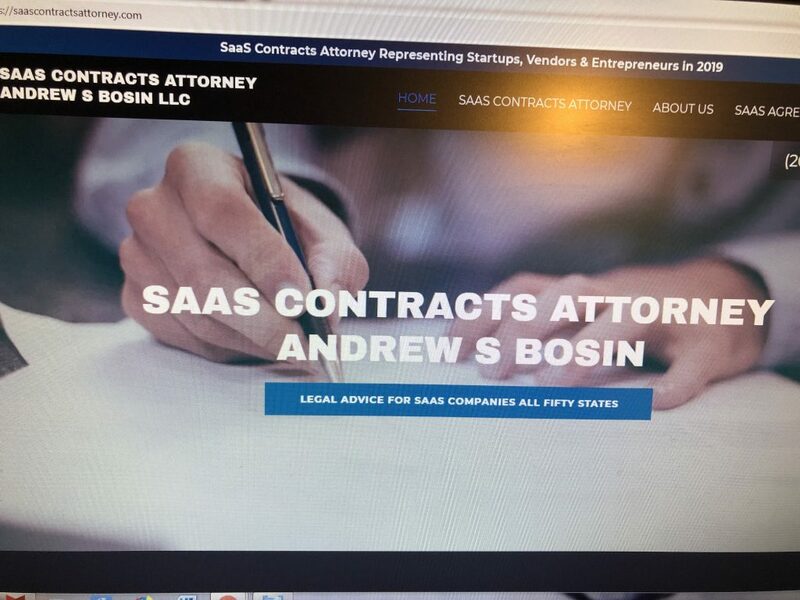 SaaS Contracts Attorney Andrew S Bosin LLC provides legal advice and counseling to entrepreneurs who are contemplating launching or joining startup companies. Andrew represents SaaS startups in all fifty states. Below is a summary and not an exhaustive list of some of the issues and questions you should raise before joining any startup. This is not being offered for legal advice but rather for informational purposes only. If it’s your idea that you’re bringing to the table everyone should sign an NDA. If you are speaking with potential partners for a startup and you are the one that is bringing all of the intellectual property to the table before you disclose to anyone the nuts and bolts of what you are doing you should require that everyone sign a Non-Disclosure Agreement (NDA). Before you commit to joining a startup you need to have several conversations with each of the other co-founders to see whether or not they are serious about leaving their day jobs to devote themselves full time to the startup. When a founder has one foot in the door and one out of the startup it makes it so much easier for them to walk away from the company when the going gets tough. There is a saying called “skin in the game.” This means that the co-founders are all in and they are not focused on their day time/full time employment paying jobs. Rather, like you they are 100% focused on working on the startup. If co-founders have decided to stay in their day jobs and work on the startup at night and on weekends it will take a long time to get the startup from idea and concept to actuality reality and working product. A robust SaaS application if being built in-house by startup co-founders working in their spare time on it could take six months just to build. Then you have to develop a sales and marketing plan. How is your startup going to be able to market and sell your SaaS product to potential customers during the day when you are working full time in your regular day job? Customers want to schedule conference calls and see demos live and in person during the work day not at night and on weekends when you are free. What if you can get a day off so you can meet with a potential customer but your partners are stuck in their day jobs? What excuse are you going to give the customer as to why your CTO cannot make the meeting? The same goes for investors. It will be very difficult to secure funding unless all of the founders had skin in the game and worked full time for the startup. A startup investment is risky. Therefore, an investor wants at least some assurances that if they put money into an early stage company that it will be difficult for a founder to walk away to stay in their day job. Before you go and quit your day job and lose possibly your only means of financial security do yourself a favor and have an in depth conversation with the startup’s other co-founders to see if your all on the same page when it comes to what type of culture you hope to build. For some, it’s all about the money and hopefully making a successful exit from the startup by having a larger company or investor purchase it. For others, it’s a long term play and they want to create something that lasts and at least in the early stages are not looking to cash out and sell the company. Some startups value the idea of giving back and either donating a portion of their revenues to charity or helping others get their startups going. You need to flush out what type of culture the consensus determines your startup is going to be before joining or not. In the haste of starting a company inexperienced entrepreneurs tend not to get things in black and white. What if you meet with some people who are interested in creating a startup around your idea and nothing happens and four months later you see that they have taken your IP and started their own company with it? Unless the other party signed an NDA it will be very difficult to claim that they stole your IP. You should never share software code that you developed with anyone you are thinking about getting into business with unless they first sign an NDA. Likewise, too many startups fail to memorialize agreements amongst co-founders in writing. It is extremely important that when co-founders are issued stock that this is put in writing with all related terms and language for vesting and claw back provisions and termination if appropriate. Do you really want to be partners with these people? Something that you should give serious consideration to when joining a startup is do you want to get into business with these people. If you don’t like them personally or there are a lot of egos in the room it’s not going to get much better if you join the company. It’s not a deal breaker but past startup experience is a huge plus. You should ask potential co-founders if they have been in a startup. Co-founders should also have integrity. You’ll be depending on these people heavily. As such, you need to be able to trust them. Also, alignment of values and motivation is critical and you should be on the same page with how you want to build the company. Like you, your co-founder(s) should care very deeply about what they do and be totally committed to the success of the company. It would be very helpful if they have a strong skill set that compliments yours. While conflict is inevitable with any partners you should be able to collaborate easily and make decisions without a ton of fighting. When deciding to join a SaaS startup having prior experience in building a SaaS business would be beneficial. If there are five co-founders let’s say and two of them have built and scaled a SaaS company your new venture will be much more along then a startup having founders with no prior SaaS experience. Building a new SaaS product is difficult enough and time consuming without having to learn the basics and principles of what a SaaS business is all about. That’s why having prior SaaS experience is so critical to the success of a software startup. You need to be prepared for the financial risks of joining a startup. It is likely that the company will have little to no funds to pay you or anyone else a salary at least until it can hopefully get some capital funding. Life doesn’t stop when you join a startup. The same bills you had the month prior in a good paying job will still be there when you join a startup albeit with the possibility of having no salary to pay these bills. So how do you prepare for the financial uncertainty of being in a startup? For most, unless you have unlimited funds or your spouse makes a nice salary you are going to struggle financially until the startup can get going and make money. You need to be prepared to tap other financial resources in order to survive financially if the startup does not offer you a salary. Likewise, you need to be prepared for job uncertainty when you join a startup as an owner. It’s ironic that you might technically have a job with a startup as an owner but not be getting paid a salary. You might also lose this non-paying job so you need to be prepared for the possibility of this happening. If your startup is going to go out of business, and it is inevitable, you need to assess the situation as quickly as you can and likely you will come to the conclusion that you need to look for gainful employment. If you join a startup you need to be prepared for the lack of structure that exists in early stage startups. For some, they start companies because they want to be their own bosses and got tired of other people telling them in their jobs what to do. For some, these people love the lack of structure. They might like working through the night when they are most productive and they could never work this way when they had a regular day job. Some people start or join startups because they want independence to work alone on projects within a startup. For some, they have a hard time adjusting to this lack of structure that subsists in some startups. While you might want to join a startup to take a risk and try something new and be a part of something exciting you might find yourself in a situation with little guidance from the startup’s founders or from other colleagues. For some, this isolation and pressure to produce with little feedback from others is not the type of working environment that most can thrive in. There is also likely the possibility of whatever startup you join not having the resources you were once use to relying upon in your salaried day job. There is a possibility that for an extended period of time there might not be HR support, unlimited tech support, food services, or even office space for that matter. Some startups meet until they get funding in shared spaces or they get together at night in a colleague’s office when the employees for his or her company have left for the day. If you can get past all of the issues that exist with joining a startup such as job and financial uncertainty, lack of resources and lack of structure you need to ascertain whether the startup you are seeking to join is properly funded? The problem with most first time entrepreneurs is that they underestimate just how much money they are going to need to build the product, maintain it, market and sell it to customers and scale the business with salaries, rent and other monthly fixed costs and capital expenditures. If the startup has not put together a budget and has only raised a certain amount of funds but clearly not enough to even get the product developed it is going to be very difficult for this company to get off the ground. You should also ask the other individuals whether or not they are connected with any investors who have shown an interest in the company. A huge flag is if no one has the ability to raise funds. If you like what you are hearing from some of the other co-founders about the product that is intended to be built and the culture they want to create it also helps to inquire whether or not they have secured any capital funding. For an early stage company there is really two types of funding. There is the possibility of VC investment but that is unlikely unless one of the co-founders has done this before and successfully exited from their startup. What is more likely is that the startup could get funding from an angel, seed or friends and family investor. This category of investor is typically a friend, colleague or family member who knows you personally and wants to help you by investing in your company. You can further break down this type of investor into two categories. The first is an investor who is not sophisticated. This does not mean that they don’t have assets or are not shrewd. What it means is that they have no real experience in investing in startups let alone an early stage company in your industry. The negatives with this type of investor are many. Because they don’t regularly invest in startups let alone companies of your type they have no way to do a proper pre-money valuation. This could lead to the possibility of inflating the valuation of your company and making it impossible to raise capital funding in the next round. Because of their inexperience in investing in startups there is the possibility that these types of investors could make demands on your startup that will hurt it down the road. For example, they might demand preferred stock so that if there is a next round they could cash out or get a discount to buying more stock. This is usually done by VC’s and could turn off sophisticated investors if there are additional capital financing rounds. This class of investor might make demands to the effect that they get final decision making approval to admit to new members or to sell the company. These types of demands could likely cause turmoil inside a small company. The second category is a smart money investor. This person or entity has done this before while investing in other startups like yours focused on a particular industry or vertical. The advantages of this type of investor is that they can likely do a proper valuation for your company and the learning curve for them to understand what your product is all about will take less time than an investor who does not invest in your industry. Hopefully, given their experience in making investments in your industry they will give you a frank assessment of the chances of success in marketing and selling your products to customers in your industry. You want investors who understand that placing harsh demands on startups such as the decision making authority to stop a sale or another investment into the company will likely detract other investors from investing. For most SaaS startups VC funding will not be an option as they typically have no revenues and very little in the way of measurable metrics such as two years’ worth of customer data in terms of the number of initial customer contracts signed and reoccurring contracts signed by the same customers. Unless your startup is founded by entrepreneurs who are well known and successful it is likely that your startup will attract VC funding. Do yourself a favor and be well prepared when you go into any meeting with a potential investor. You should have a firm grasp of your product’s value proposition and why it will solve for problems in the marketplace. And, you should also prepare financial projections which summarize costs, expenses, revenues and capital expenditures over a period of time no less than a year. Does your vision and strategy for the startup line up with the other co-founders? Another question that you should ask yourself after meeting with some of the other individuals that want you to join their startup is does your vision and strategy of where the company should be heading line up with the others. For example, if the others want to sell the company’s product into an industry that you know will not be successful then perhaps this startup is not for you. Or maybe they want to launch in 10 different verticals and you know this is a mistake. Has the startup identified what type of customers they are going to sell the product to and how are they going to go about marketing it. It’s difficult enough alone building and completing a good web based product that works and having the funds to market and sell it. Then you add to the mix the dilemma of how is the startup going to implement and execute on a marketing and sales strategy. A lot of startups don’t formulate a solid marketing and sales strategy until it is too late to pivot and the startup fails. Or, what happens is that ego gets in the way and the co-founders take the position that because they have built such a great product that every company they speak to will want to use it. This is not a strategy for success. Implementing the most effective marketing and sales strategy could mean the difference between going out of business or survival so it is critical that you nail down even in these early stages how the startup is going to attract customers. Another trap that you need to be careful of is that sometimes startups fail to rely on help from marketing professionals and decide to do the marketing themselves. Unless the startup has major connections at enterprise companies that are going to test the product in-house this strategy is doomed to fail for several reasons. If the startup does not have connections that are ready to go and test its product then they are just sending emails on social media and business sites that will likely not yield much interest. Hopefully, if a startup falls into this trap it can pivot quickly and subscribe to automated marketing and sales software which enables companies to send out thousands of emails to contacts and connections and automates the sending of and responses to emails.